Viral vaccines are usually produced by anchorage-dependent cell lines. At industrial scale, these cells are either cultivated in static mode on multiplate systems (Roller bottles, Cell Factories, Cell Cube, etc.) or on suspended micro-carriers (porous or non-porous) in in bioreactors. Multiplate systems are bulky and require a lot of handling operations, whereas microcarrier cultures require numerous operations (sterilization and hydration of carriers,bead-to-bead transfers) from pr eculture to final process. However most of the currently available disposable reactors are not well adapted to cultivate animal cells immobilized on microcarriers as perfusion is the technology of choice for these productions. 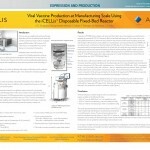 iCELLis™ is a scalable range of fixed-bed disposable bioreactors that combine the advantages of single-use technologies with the advantages of a fixed-bed. Fixed-bed reactors are known to retain and perfuse non-adherent and adherent cells at high-cell densities in smaller reactors with low shear stress. In addition, cells in packed-bed remain much longer viable during cultivation in an easy operation manner.